MILLERSBURG -- Rob Pelance is taking his talents from inside a round barn to outside on a rectangular football field. The Fairfield Junior-Senior High School senior wrapped up 35 performances of the musical "Fame" at Nappanee's Round Barn Theater at Amish Acres just in time to start rehearsing "When Kings Go Off To War," with Fairfield's marching band. 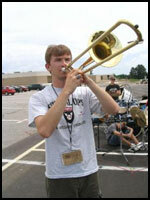 Rob plays trombone in marching band, but his performing talents stretch further. Pelance sings in four octaves -- alto to low bass -- and plays baritone and bass guitar. Acting, though, is what he loves. He wants to make performing on stage his career. He likes the way it feels when audiences connect with his music, dancing, singing and words. "I guess one of the reasons I love performing is even just for a few minutes, people can forget the messed-up world and experience the emotion of whatever the performance entails." Rob's band director at Fairfield, Mel Carpenter, sees his drive and ambition. "I think he'll do whatever he sets out to do," Carpenter said, adding he's watched Rob act. "It brings out a personality I haven't seen before." A teacher at Rob's former school, Wawasee Middle School, gave him the kind of encouragement that got him started performing publicly. Before that, Rob sang alone or with his mom, Judy. "I sang, but not very well. I was shy about my voice, but he (the teacher) showed me I had a voice to work with." Rob knew he had the voice, but still got nervous at the March audition for "Fame." "I picked a focal point and didn't look at the judges," he said. He spent a week putting together the song "Luck Be A Lady," from the musical, "Guys and Dolls" for the audition. Three or four weeks went by before he got the phone call, letting him know he was one of the three interns of nine selected. "My heart just jumped out of my chest," he said about hearing that news from the Round Barn Theatre director. His mom watched eight or nine of the performances. "She was definitely the proud mom," he said. "My mom said I got my singing voice from my father," he said. James Pelance died when Rob was 6 years old. Proudest accomplishment: "Acting in the Round Barn Theatre after auditioning for an internship program." Rob was one of three interns selected from a field of nine for a role in the recent production of "Fame." Hero: "I'd probably have to say my mom. She's been through so much in life and she's amazingly strong."